I think that one way to have fun on the streets is to hide in the bushes. We practised this by hiding under the stairs where we chatted and it sounded echoey. I also enjoyed seeing different shapes in the clouds. I saw a bird. 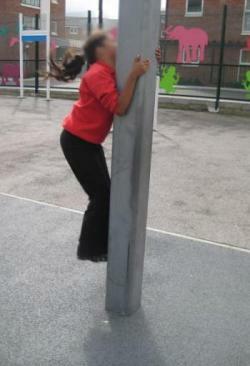 Here is a picture of me half hugging, half climbing a post. Also I was good at following other people's moves. I thought it would be good to look for short cuts. We spent some time playing follow my leader and I came up with some pretty good moves that the whole group had to copy. The main thing I do to have fun when I'm walking to school is imagine that on one side of the path is water with alligators in it and other is fire. We all tried this, and then tried different ways to get off the path. When I first thought about how to have fun in the streets I thought about scateboarding on handrails. Then I thought about what I do to have fun on the way to school. Sometimes I walk on low walls. 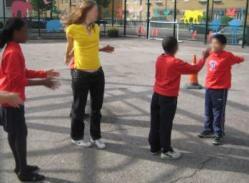 We all practised doing this together by walking along white lines in the playground. 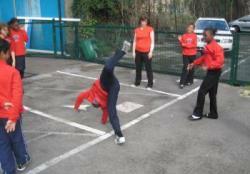 But this boring so I thought we could could make it more interesting by cartwheeling off the wall at the end. We tried quite a few of my moves out. We also tried bounding up stairs like an animal. When I walk to school I notice all the new buildings that are being built and I wonder about where the entrances are going to be. I also notice that there is sometimes a plane pulling a Stella Artois advertisment! My move is going to be called Yemisi's move. It's just what I do when I'm standing around to make it more fun. It's a bit hard to show in a still photo. 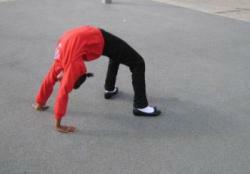 When we were practising Abid's way to have fun in the street, I came up with this way to finish the move. It's called "the crab".